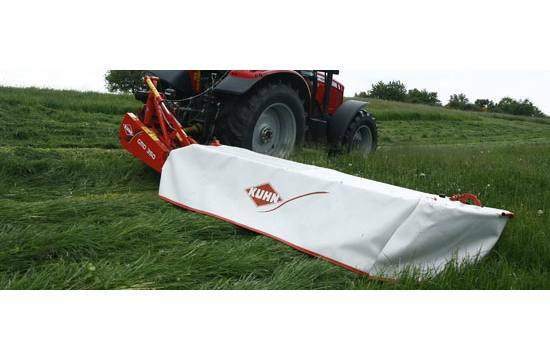 The GMD 350 is Kuhn’s largest vertical folding disc mower. The 3-point hitch and flotation mechanism ensures correct ground pressure through varying terrain. Each mower has a low cutterbar profile and computer designed discs that allow for a closer and cleaner cut. The OPTIDISC® cutterbar needs no oil changes, reducing maintenance requirements. The PROTECTADRIVE® system protects the cutterbar gear train so operators spend less time fixing and more time in the field. This mower features the hydro-pneumatic suspension system provides improved suspension and easy adjustment for different conditions.